I thought you might enjoy these e-books from www.PatternMart.com. These e-books are delivered via PDF format and contain lots of helpful tips for craft business success. I love looking for Valentine's Day patterns. Here are a few that I found today at www.PatternMart.com. CUPID stitchery VALENTINE pattern E PATTERN email Raggedy Ann doll Be Mine retro primitive heart BRAND NEW 2010 decor posies embroidery ! Snowmen are great decorations for the entire season of winter. I hope you like this unique collection I have put together for you today from www.PatternMart.com. Enjoy today's candy cane pattern collection from www.PatternMart.com. Good morning! Today I have selected a few of the sweet gingerbread man patterns available on www.PatternMart.com for you to enjoy. Here are a few more free downloads from www.PatternMart.com. 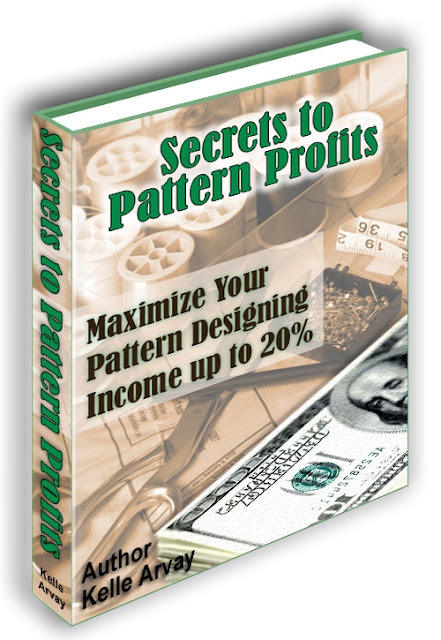 Have you ever wondered how you could increase your revenue for your pattern designing business? Perhaps you are thinking of starting a pattern design business? Kelle Arvay, owner of Pattern Mart and a pattern designer for many years shares with you her techniques and secrets in this 21 page in depth eBook on ways to increase your profits! Let's make your pattern business even more profitable in the New Year! "Wow, I'm having a ah ha moment after reading this! I would of never thought of the tips mentioned and I can't wait to try them. Thank you so much for putting together such a helpful book!" - Tina M.
"I've been designing doll patterns for 3 years now and I can't tell you how helpful this book has been to me. The social media tips have really helped me and I'm already seeing an increase in sales!" - Cheryl H.
You must create a Pattern Mart customer account and log in before you download these patterns. I thought you might enjoy a few more Santa's Helpers Patterns from www.PatternMart.com this week. Enjoy! Aren't these the most adorable Santa's helpers you have ever seen? Find more cuties at www.PatternMart.com.